ClassOne Technology designs and builds the Solstice Plating System for several semiconductor process steps of the wafer-level packaging process that includes, Cu Plating, Cu RDL, Cu Pillar Plating, Cu Bump Plating, Barrier Plating, and various type of lead-free Solder Plating. One of the benefits of Wafer Level Packaging (WLP) processes is the flexibility it provides to the layout of the final interconnect metallization on the die. The last metal vias do not have to terminate in a large pad at the periphery of the die as was required with wire bonding. With the use of a Copper Redistribution Layer, or CU RDL, designers have much more freedom to route signals within the die to interior position where the soldering points will reside. This also provides shorter signal paths so fewer losses occur. Usually between 5 and 10 microns thick, the Cu RDL layer can be processed as a stand-alone layer, or making use of the same mask, have a barrier layer such a Nickel deposited immediately afterwards. Following the RDL, a taller copper structure is formed where the solder connections will reside. Depending upon the height and aspect ratio, this is called a Cu bump or Cu Pillar – pillars tend to be the smaller, high aspect, more densely packed structures. This bump (or pillar) is defined by its own mask that is typically formed in a thick photoresist ranging from 20 to 100 or more microns. Here again, depending upon the type of solder to be used later in the process, it can be advantageous to deposit a diffusion barrier on the pillar using the same mask. Again, Nickel is often used for this layer, although in some cases other metals have been successfully used to minimize unwanted intermetallic formation. As with other template plating processes, the key to success resides in finding the proper balance between performance and cost. From a performance standpoint, variability of deposit thickness should be minimized on three different scales: within wafer, within die, and within feature. 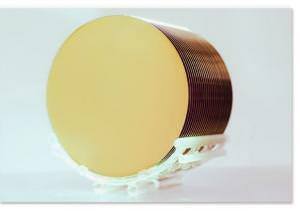 The geometry of the plating chamber affects within wafer uniformity to the greatest extent. By making use of advanced design techniques such as computation fluid dynamics (CFD) and relying on their previous experience at Semitool, the designers at ClassOne Technology have developed a simple, yet powerful single-anode chamber that delivers a uniform electric field and fluid flow at the surface of the wafer. The bottom line: outstanding results across a range of metal thicknesses make use of any one of a variety of commercially available electrolyte types without the excessive costs of multi-anode systems, or the operational difficulty with thieves and racks. To minimize with die and within feature thickness variation, the ClassOne Solstice Plating System offers many features as standard. Capable of working with a range of electrolyte types, the Solstice Plating System has the ability to rotate the plating head clockwise, and counter-clockwise during processing in order to prevent fluidic bias, or tilting within a feature. Pulse power supplies are also standard to assist in reducing overall within die and within feature variation. With the ability to dose 3 additives directly into the bath using precision micro-liter injectors, chemical additives can be used to further improve results. ClassOne's Solstice Plating System is easily configurable for the multiple metal depositions required for wafer level packaging including Cu Plating, Cu RDL, Cu Bumps, and Cu Pillars. Standard also are quick change and low cost contacts and seals. Changing substrate diameters is also quick and simple: a single bolt is loosened to change out the drive head which determines the substrate size.